2 March 2018, Fauji Farm, Maloya, Chandigarh: It was after 4 long years that Sri Maharaj ji is graced the occasion of Holi with His divine physical presence. 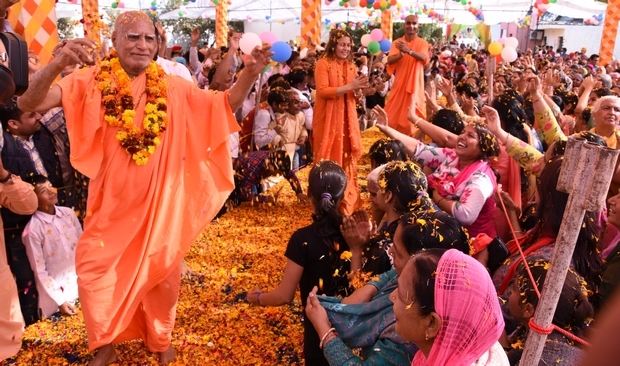 While Sadhvi Ji introduced us to that real color which an aspirant of inner journey must seek and inspired us to embrace it once and for all, Sri Maharaj Ji shared some basics on how to stay colored forever. Let us too get colored! Holi is known to be a festival of colors. This time, how about we play such a Holi that we get colored in His, our beloved’s color once and forever. To begin with, which color is that? A color that just doesn’t paints our clothes or mind, rather paints our soul, a color that never fades, a color that cannot be outdone! What kind of color is it? Well, Gurbani proclaims it to be Red, a symbol of love, and a symbol of inseparableness. We often hear that, ‘yesterday there was a lot of love but today there isn’t.’ If today it isn’t, it never was. Devarshi Narada states, ‘love is that which increases with each passing moment.’ On the contrary, as long as our desires get fulfilled, we believe in and recite that there is love. The moment some hardships find our way, in the form of physical, mental or financial, our faith or what we had so far believed to be love loses its ground. In world we might face failure one after another, yet we do not ignore it, rather astonishingly continue to keep on trusting it. Now if our mouth is overfilled with salt, we certainly cannot understand what does it feel to taste sugar. Life is short; why waste it in back bitching? Why not surrender like Mira, whose only priority was her Beloved. Remember, mind is like a tool that can either drag us to endless knots of life and death or lead us to our ultimate abode. Why not choose later? Why not become His? Why not get colored once and for all? … here, question is how to be His? First of all, believe that He is ours. We are His children and very much within our right to play Holi, i.e. only we, Humans are blessed to do so. Animals certainly cannot. They can neither talk or laugh, are bound to Earth with either of their two/four hands/feet, and are almost always scared. Their tendency is to grab everything they get their hands on. But we instead can give with the hands. We can laugh, can contemplate and therefore, eventually, there comes a time, when we begin to connect with the divine source within. Upon sorting out our priorities in rightful manner, there won’t be any place left for mental scaredness, or physical dullness or stiffness. People often say that one should stay away from sinner and be afraid of sins. But what we believe in is that neither sin nor sinner is to be hated. If we could instead learn to see Him even behind that curtain of sin of the sinner we have (mostly out of ego) declared as, we would be able to celebrate real Holi. True, one must not encourage irresponsibility, or insincerity but, as long as we continue to associate our reason of either being happy or sad with others, we would not be able to thrive on the inner path. Whatsoever may come, whether roses or thorns, i.e. praises or insults; digest it all. Burn away the unnecessary accumulation of kaam (lust), krodh (rage), lobh (greed), moh (attachment), ahankar (conceit), knowing that each and every soul is a part of, belongs to One, Him. Let’s prepare to get colored in the divine color!